Phoebe gives lots of time between disasters to relax and build your colony. But beware - if she's set at a high challenge scale, she'll hit as hard as anyone. 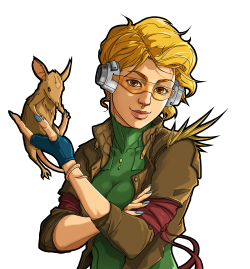 Phoebe Chillax, is a storyteller whose main characteristic is the long break between challenges, leaving the player with enough time to rest and recover after an event, and live without much to worry about. This gives new players a more relaxed experience to get familiar with the game. When playing with Phoebe, in the beginning its always likely to gain one or two more colonists, typically a wanderer. A trade caravan or two shall also arrive before completing a full season (15 days).